MP3 is a widely-used audio format for audio streaming and storage. With it, consumers can easily transfer and play music on almost most of the digital audio players. You can gain different MP3 files from iTunes Store, Last.fm, Amazon MP3, Mp3Raid and so forth. When you got a new iPhone 6s, you probably like to enjoy some high-quality songs on this device and may have tried various approaches to getting an MP3 file for your iPhone by trial and error. Luckily this post will offer your specific guidance on how to transfer MP3 from PC to iPhone, so that you can enjoy your beloved music at ease. Before using iTunes to move MP3 files, you need to make sure you have installed the latest software version on your PC. Usually, iTunes will automatically check its version when it is run and you may be reminded to have an update check by clicking the “Check for Updates” menu. Plug into your iPhone 6s to computer with USB cable and run iTunes. Locate and click on your device. 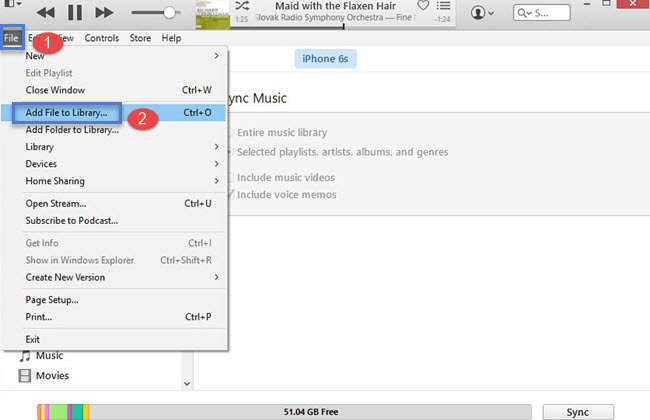 Your iPhone’s icon will be shown in the upper-left corner of iTunes window. To transfer MP3 from PC to iPhone 6s, you need import MP3 files to iTunes library by choosing “File” > “Add File to Library”. Click “Music” from “Settings” tab. 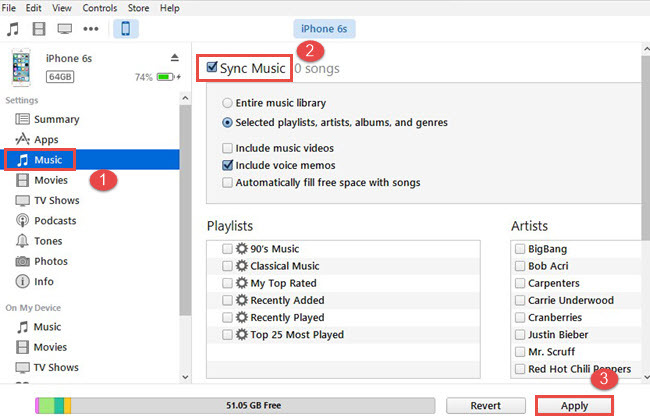 Choose “Sync Music” to sync the entire music library or a certain playlist and finalize the music transfer by hitting on “Apply” button. Usually it will take you a while to finish the transfer. iTunes is a feasible way to transfer, buy and organize your music library, but its complicated operations often drive users crazy. Due to its defects, nowadays more and more iPhone users turn to iTunes alternatives for help. 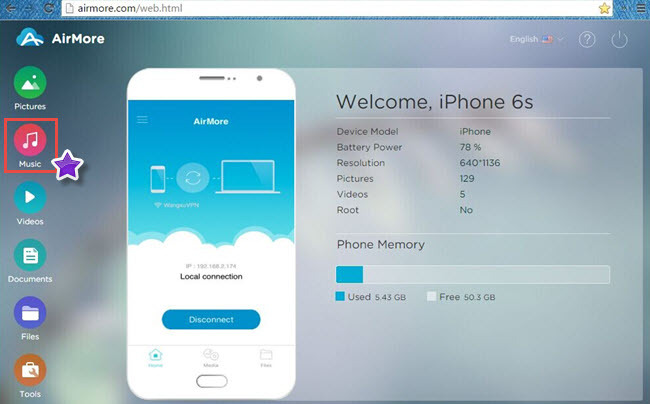 AirMore is a very popular web-based app, which is a wireless mobile management software for iPhone and Android users. You can use it to manage files such as music, videos, pictures, documents without using USB cable on your Mac and Windows. Now follow the guidance below to make MP3 files transferred on your iPhone. Go to App store to download “AirMore” app and install it on your iPhone. Search AirMore website on your browser to connect your iPhone with the computer by scanning the QR code or choose your phone in Radar. It is required to put your iPhone and computer under the same network for a successful connection. Once connected, you can see your handset content under several function tabs. Click “Music” menu and all your MP3 files stored on your device will be seen. Click “Import” and select MP3 files saved on your computer. 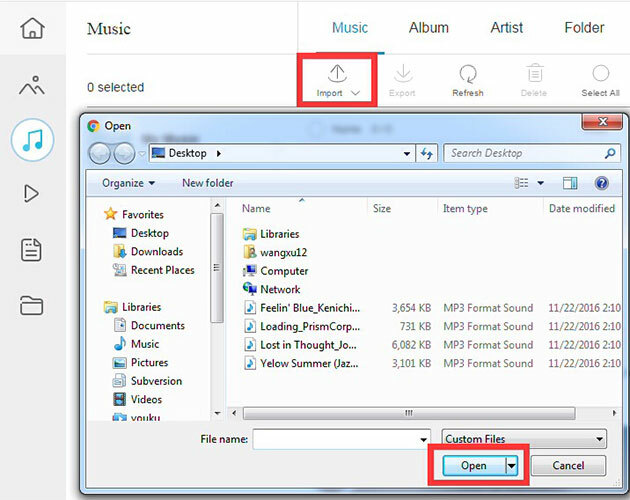 Hit on “Open” and it will begin to transfer music from PC to iPhone. It usually spends a little time for file transfer if the network is smooth and steady. In addition to transferring files from PC to iPhone, this app also allows you to backup your phone content on your computer by clicking the “Export” button. Whether on your Mac or Windows, this tool empowers you to have a quick switch between phone and computer. When you acquire the above two methods, you will know how to transfer MP3 files to iPhone 6s. When taking efficiency and user-friendliness into account, AirMore would be a better option. There are also other solutions like Apowersoft Phone Manager or iCloud you can make use of to transfer your iPhone content. Based on your actual situation, choose the right one that suits your needs. Rating: 4.3 / 5 (based on 103 ratings) Thanks for your rating! Only AirMore can read the transferred MP3s !! Dear Albert, sorry but due to iOS system restriction, AirMore cannot transfer music to iPhone's Music app which is why you can only read them in AirMore app. However, if you demand to transfer those music files to your phone directly, please kindly use our professional desktop program - ApowerManger. You can find transferred songs in the iPhone music app through this phone manager tool. If you are interested, this is the product page and here's the usage instruction. Thank you! Have a nice day! It was successfully imported my mp3 songs, but when i open my music in iphone 6s i cannot find my songs. where is my mp3 imported songs. Please help me where to find it. Thank you. Dear Bianca, Thank you for using AirMore. However, due to iOS system restriction, AirMore cannot transfer music to iPhone's Music app. But you can find the transferred music in AirMore app. If you have a strong demand of transferring these music to iPhone's Music app, please use our professional phone manager desktop program - ApowerManager. You can find songs transferred using this program in iPhone's Music app. Thank you for your support and understanding! Simple and effective. No over kill. Every app should strive to fulfill this description. how can i make my songs into ringtones on iphone? Hi allan. You can refer to this post to make iPhone ringtones. If i use AirMore, is there a way I can get it onto iTunes music? Hi Anon. Sorry, AirMore cannot transfer music onto iTunes music. You can use Apowersoft Phone Manager to do that. Thank you!